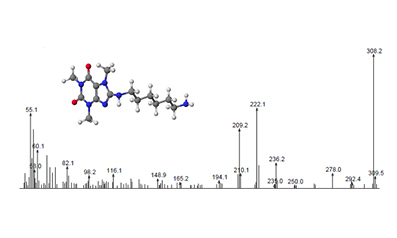 The mass spectrometric fragmentations of ten new 8-alkylaminocaffeine derivatives were investigated. The fragmentation pathways of new polyamine derivatives of caffeine on the basis of low and high-resolution electron ionization (EI) mass spectra were discussed. In the case of new compounds, classical fragmentation of purine skeleton related to the elimination of a neutral molecule CH3N(1)C(2)O from a molecular ion was not observed. Nevertheless, new, interesting fragmentation of described caffeine derivatives was observed. Moreover, heats of formation of odd-electron ions of 8-alkylaminocaffeine derivatives were calculated.